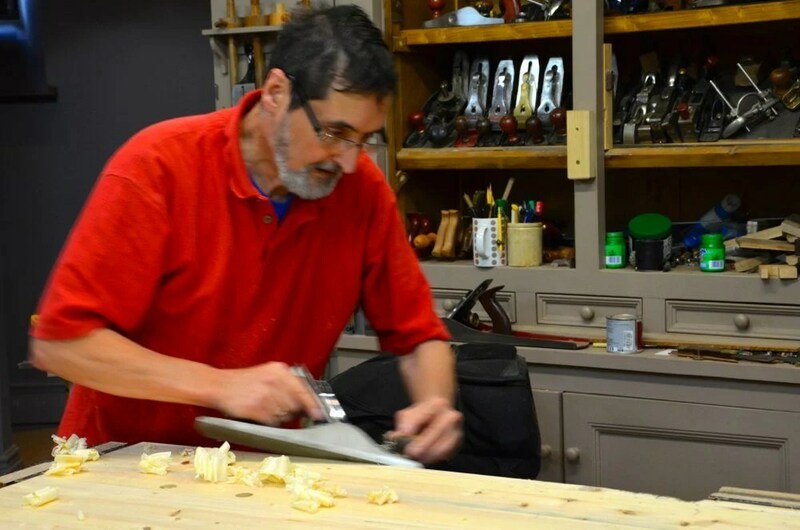 Using any wood for a workbench will almost certainly be affected by exchanges of moisture in the atmosphere being sucked into and released from the wood even though the laminations should hold just fine. This then changes the flatness of the top because, depending on the way the wood orients in relation to the annual rings, different sections expand differently. Sometimes the difference is greater on one piece than another and its this that then causes undulation in the surface. When that happens it can be annoying and especially so if the work in hand depends on flatness. Making my picture frames is a point in case, both for the frames as I assemble the components for fitting and testing the mitres but also for the shooting board because it shouldn’t rock. 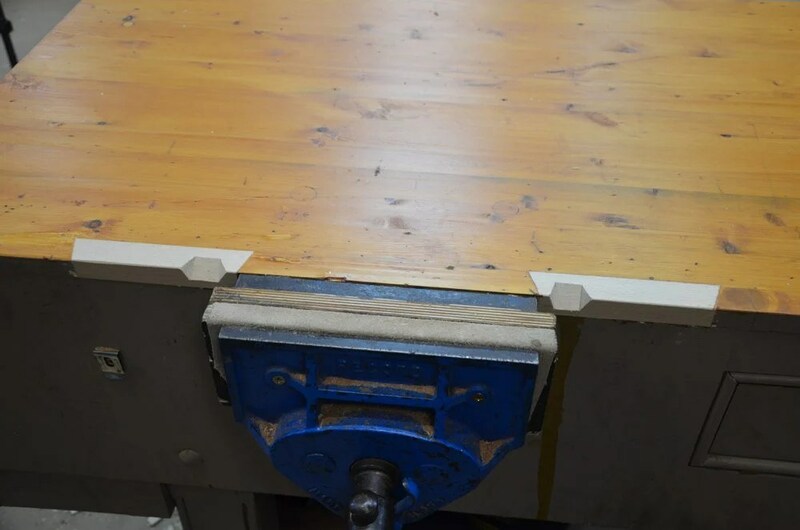 In my experience bench tops move and especially so if the benchtop is thick and wide. An unavoidable dilemma for bench makers and users. By wide I mean generally about 16” and wider. By thick I mean from an inch and a half and on up. 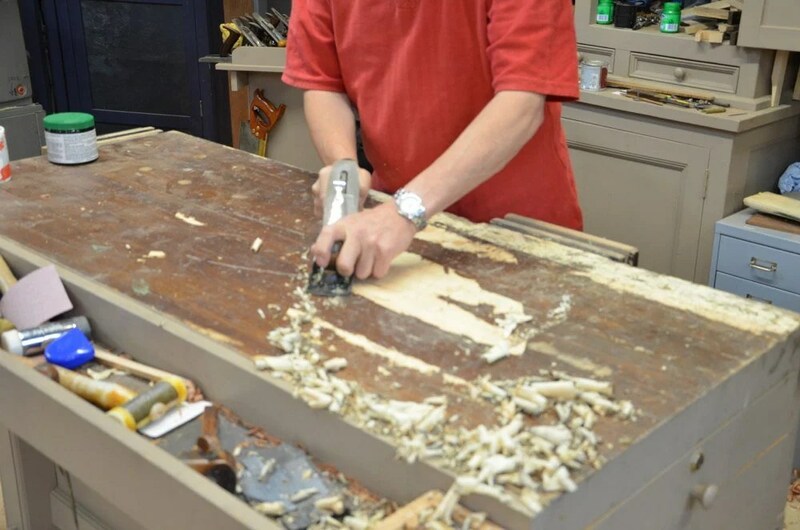 In actuality all tops move regardless of thickness and width but it becomes accentuated in larger sections of wood. Thin tops such as those we use for a regular tabletop rarely show much movement at all, but this of course is not suitable for benchtop work. 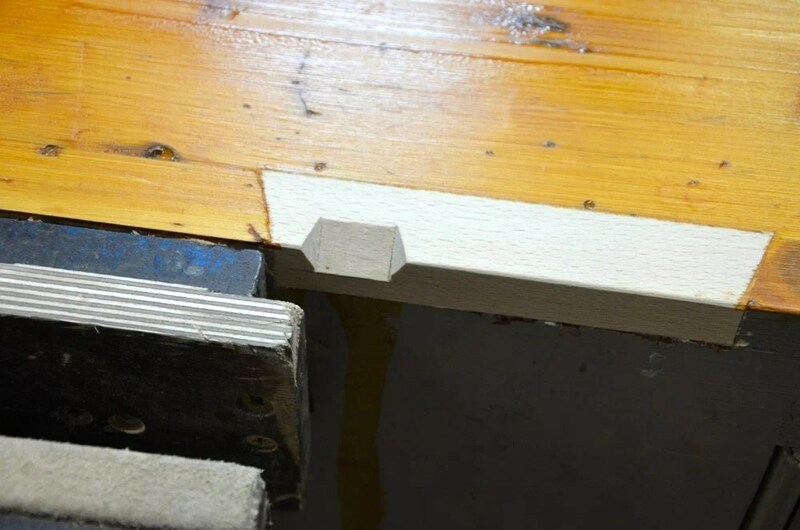 Although the work area requiring thick and heavy mass is actually more localised to the area nearest the vise area of the bench, the remainder of the bench top being the same thickness adds stability, equality of weight and thickness and this in turn adds the uniqueness we workers of wood depend on. Without it we feel totally ill-equipped for work. Oh, it is worth noting that movement takes place in the first year or so. The urge to flatten sooner should be avoided otherwise you will end up doing it two or three times. I would wait for a couple of years and then do it. After that time wood becomes less elastic and movement slows down. It stabilises you see. This is a form of conditioning we used to call seasoning. It works to wait and allow nature to do its thing. 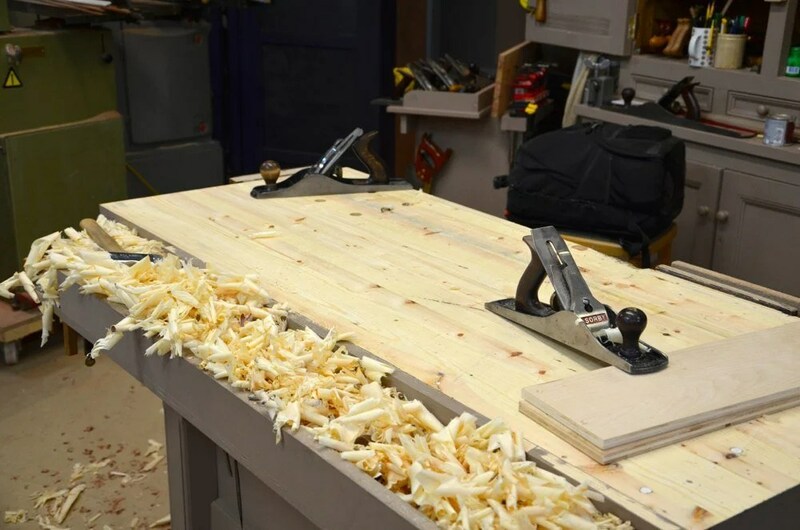 Flattening the benchtop on wider benches is simple enough. In this case I used a #5 jack plane for the whole process and in a few minutes the highs hit the bottom of the lows and I was left straightening to perfection. This benchtop was made from Northern European redwood pine. The bench is dead rigid and does not flex to unevenness in the floor. That means the benchtop should be untwisted as I t won’t change like lesser benches. 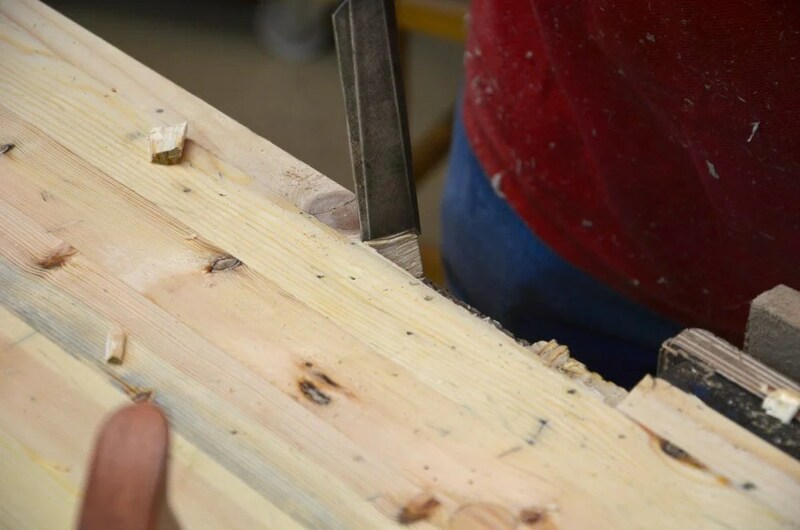 It also means that any twist should be corrected through planing. I checked mine with two pieces of plywood stood on edge. Straightening the ends with the jack cross grain gave me a starting point. I stood the ply pieces on edge and eyed the two tops to see if I was in wind. There was a small amount of twist so I levelled the two extremes until no twist was evident. I did the same in the mode section and then straightened all points in between and finished with long with-the-grain strokes for final smoothness with the #4 smoother. I remove the corners just a tad to make sure there are no weak edges otherwise they break off anyway. Easy enough to plane all round and once true I got rid of the whiteness for my photography and filming needs by using an outdoor water-based stain finish from Sandolin using three thin coats. I roll on the finish with a 4” sponge roller for speed but these leaves suction bumps like minute polka dots in the surface as a texture. To remove this I then draw the sponge in fixed position (so it doesn’t roll) by jamming the roller with my finger and pulling from end to end of the bench. This evens out the surface so I can still see the grain clearly. Another thing I added in the finished refinished top is two inserts with a “V’ channel notching to accomodate saw cuts each side of the vise. The saw kerf causes this anyway so I may as well add the recess. Dovetailing it in and gluing it in place means it will hold fast but I can readily replace in a few years time of needed. It smooths out the appearance and means the saw catches less on the corners that rip and look ugly. 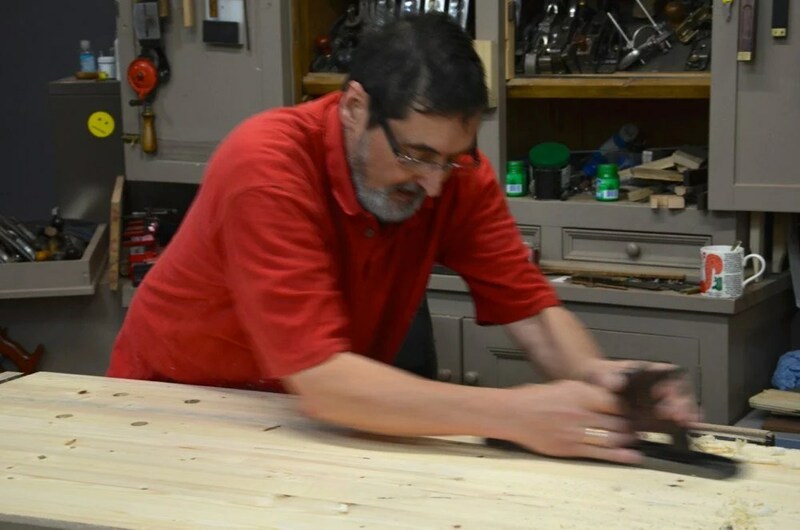 Does applying finish help stabilize the bench? 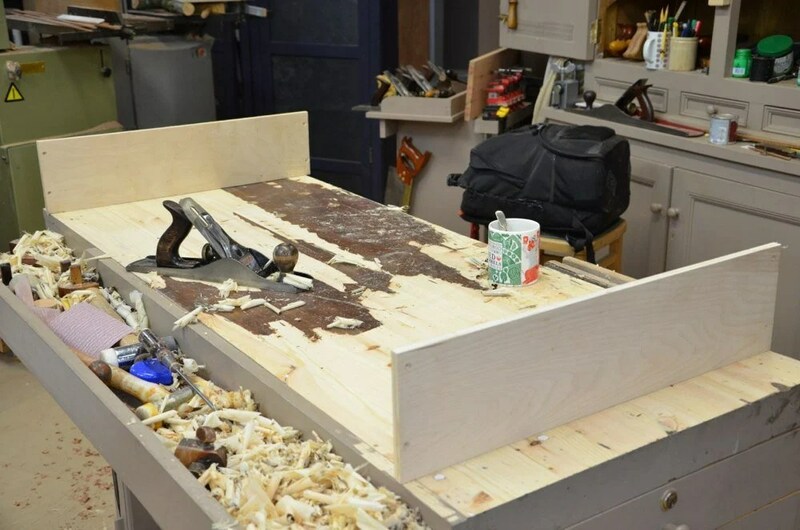 If so, should we make sure to add finish to the bottom of the bench-top when first building it so that both sides of the bench top will exchange moisture comparably? Can applying stains, dyes, and finish, which are absorbed into the fibers, cause the bench to move again? Is this a time to avoid water based products? hi paul are the inserts next to the vice made from beach . We’re going to miss that old, beat up top. It won’t take long to degrade. The image most likely won’t show up, but I thought it would be worth a try. It seems you have condemned two rows of dog holes in front of the front vise. We know you prefer clamping methods combining the vise and a clamp. What is the metal thing at the left of the front vise and what is its purpose? 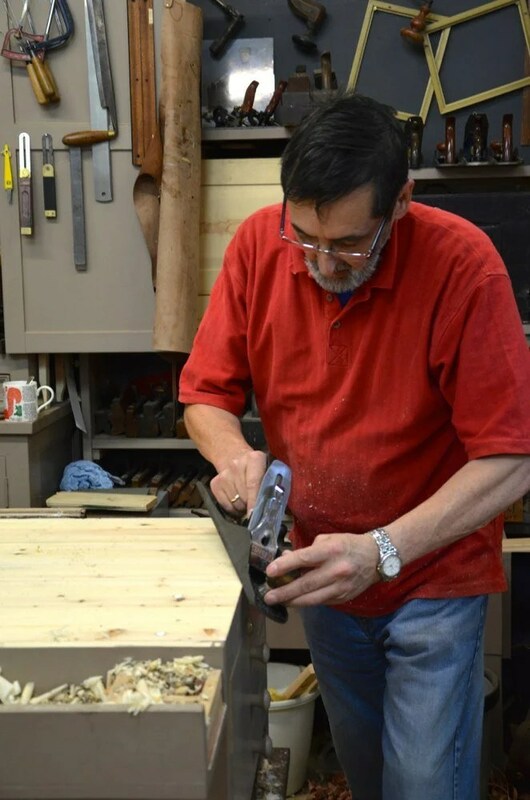 It is good to see a bench made with wood with lots of knots (cheaper); it is reassuring when we see all those nice workshop furniture elsewhere. Sylvain, are you talking about the clamp/clip spring? It looks as if it origins from a tape measure. One can take it to hold a piece of paper or a little towel. Paul looking good, nice job. My bench is not quite a year and I did not apply any finish other than a few coats of wax. I like the idea of the notch grooves will put this in my bucket list, great idea. Thank You Paul. I was going to flatten mine again but I will wait now for a couple of months. I was wondering why it changed after I had it so flat in the initial build. I was wondering if I had done something wrong. Now I know its normal. It looks way better without the previous dark wood stain. They say lighter colours improve one’s mood. Are you going to start wearing a tie and flat cap for your videos (like in the pic you posted recently), now that you’ve got a posh bench? It won’t stay posh, just flat. I am recycling my old decking to make my bench at the moment – really weathered wood (most likely also pressure treated), I’m not sure how old it is. It’s been quite hard to work as many of the beams had a lot of twist in them to start with. In my excitement to get going, I rushed the first half of the worktop and laminated up before it was ready and now has got small gaps in it (stupid I know – I’ve learned that trying to save a bit of time at the start of the project will add a lot of later on trying to correct it or causing un-correctable mistakes), and am taking my time with the other half making sure to ‘unwind’ each beam as best as I can. Is it imperative to have each perfectly twist free at this stage or is a small amount acceptable? Will it get lost in the length of the top or cause problems? Aparat from not looking that great, will little gaps be a big problem? I figure over time they’ll just fill with sawdust. Do you think using this old wood will make the top move again over the next two years? Also, it has a few knots along the way as well which I’ve found difficult to reduce to the height of the rest of the top. They seem to stay as little humps and bumps. Is it just a case of resharpening the plane and persisting with these till they’re reduced? On your next post you say your bench is 32″ by 5ft. Is that 32″ tall or wide? I’m 6’4″ so am planning to make mine 42″ tall. Is that too much do you think? I can still chop a bit off the bottom of the h-frames it need be, but would make the lower cross beam a bit lower than it is now. Thank you once again for your time and input. Wow! You like to build in your own problems before you start. I do understand wanting to use up wood so I will accept your strategy to that end. It is most likely going to work fine. Often the other laminated pieces will counter the one rogue board as long as they are not all biased in the same direction. Small gaps will not necessarily adversely affect the laminated top either, but it is always easier if you strive for accuracy across the whole. Every in accuracy will lead to several more that you create by not dealing with the issues as they occur. I deal with this with students all the time because for some reason they think that somehow things are most likely to work out when reality is usually the opposite. It’s a. It like making an error in your bank calculations and thinking your miscalculation will somehow be reconciled by the bank staff and you thinking it will be, well, OK. You get to the end of the sum and see that with compound interest and charges for overdrawing you are severely in trouble. 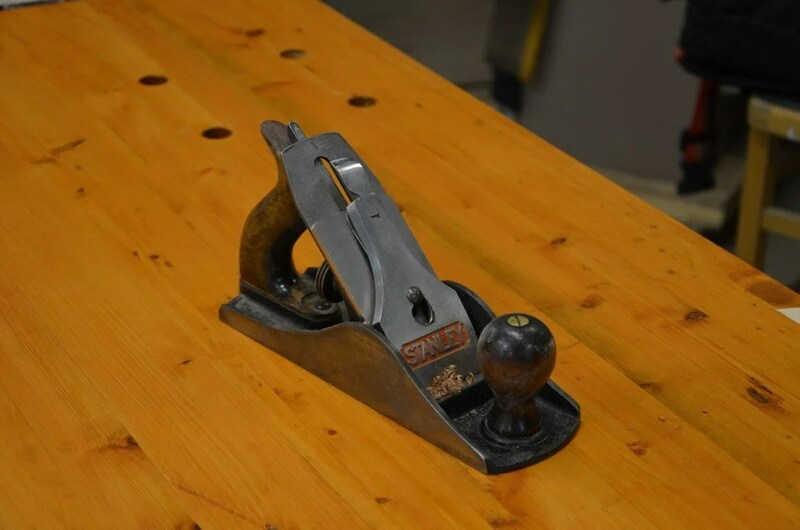 Accuracy is everything and the same is true with sharpness with your plane for planing stock. The reason the knots bump is because the plane has dulled. Knots make little difference if the plane is sharp. A knot can mean you must sharpen up several times to level the work. There is no reconciliation if accuracy and sharpness are compromised. Bench height is 38″ for me. The width I gave was across the bench. 42″ seems good but you could even add an inch and cut it down after trying it for a few days. Thank you for the reply. As always, very good advice. Yes, I have made life difficult for myself – it feels good to give something a second life, but will certainly be buying proper stock once this is done. follow up question, the width you gave across the bench, was that top or including the well? Presumably it would be a good idea to make sure that the floor is level before you start. 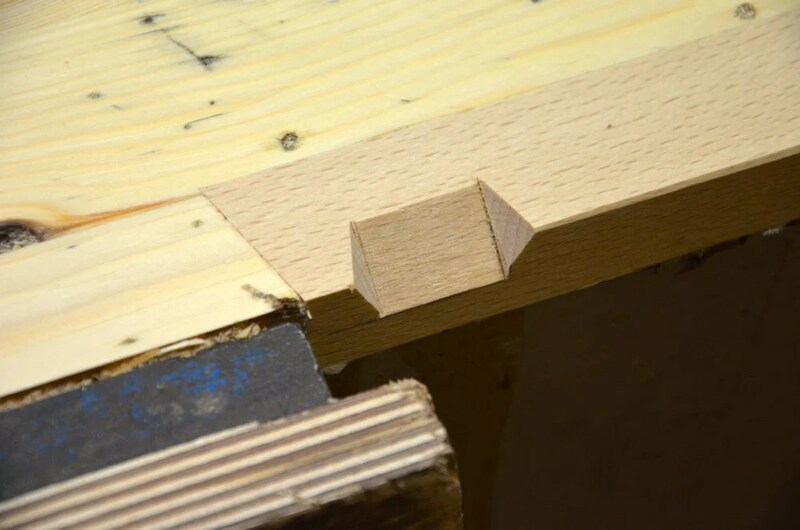 Even the most rigid well made bench will have some twist put in it by an uneven floor. Surprisingly my bench stays rigid no matter where I place it and I have to shim-wedge it all the time because I have to move it for the camera work even in just a few inches. Blimey! That’s one rigid bench considering its 5 ft long! Loving the videos by the way Paul. Wednesday afternoons are very much looked forward to. Paul, what method did you use as far as cross grain, depth, against grain, sharpening and so on?